Originally uploaded by Tres Monedas. 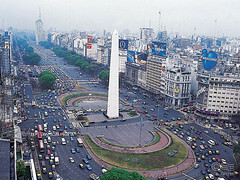 I’m in Buenos Aires for the week on a family vacation. The Gotham Gal and I came down here a decade ago while I was doing a lot of latin american internet investing (Starmedia, Patagon, MercadoLibre, and a bunch more). We loved this city and promised ourselves we’d be back with our whole family. And so we are. We’ll be relaxing, walking around, eating, drinking, and enjoying ourselves. I’ll post a bit on the trip as well as tech stuff and year end music. I plan on having something here every day. But if you want a good travelblog of this trip, make sure to visit http://gothamgal.com . She’s the best travelblogger in the family by far.